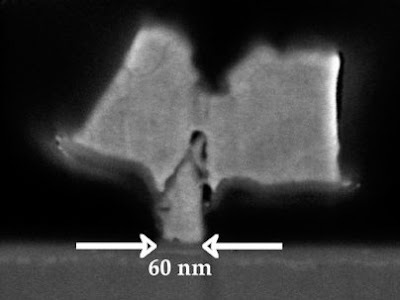 This image shows a cross sectional view of the indium gallium arsenide transistor fabricated at MIT. The critical dimension is 60 nanometers, similar to that of state-of-the-art silicon transistors. MIT engineers have demonstrated a technology that could introduce an important new phase of the microelectronics revolution that has already brought us iPods, laptops and much more. The work will be presented at the IEEE International Electron Devices Meeting Dec. 11-13 by Dae-Hyun Kim. Kim is a postdoctoral associate in the laboratory of Jesus del Alamo, an MIT professor of electrical engineering and computer science and member of MIT's Microsystems Technology Laboratories (MTL). "Unless we do something very radical pretty soon, the microelectronics revolution that has enriched our lives in so many different ways might come to a screeching halt," said del Alamo. The problem? Engineers estimate that within the next 10 to 15 years we will reach the limit, in terms of size and performance, of the silicon transistors key to the industry. "Each of us has several billion transistors working on our behalf every day in our phone, laptop, iPod, car, kitchen and more," del Alamo noted. As a result, del Alamo's lab and others around the world are working on new materials and technologies that may be able to reach beyond the limits of silicon. "We are looking at new semiconductor materials for transistors that will continue to improve in performance, while devices get smaller and smaller," del Alamo said. One such material del Alamo and his students at the MTL are investigating is a family of semiconductors known as III-V compound semiconductors. Unlike silicon, these are composite materials. A particularly hot prospect is indium gallium arsenide, or InGaAs, a material in which electrons travel many times faster than in silicon. As a result, it should be possible to make very small transistors that can switch and process information very quickly. Del Alamo's group recently demonstrated this by fabricating InGaAs transistors that can carry 2.5 times more current than state-of-the-art silicon devices. More current is the key to faster operation. In addition, each InGaAs transistor is only 60 nanometers, or billionths of a meter, long. That's similar to the most advanced 65-nanometer silicon technology available in the world today. "The 60-nanometer InGaAs quantum-well transistor demonstrated by Professor del Alamo's group shows some exciting results at low supply voltage (e.g. 0.5V) and is a very important research milestone," said Robert Chau, senior fellow and director of transistor research and nanotechnology at Intel, a sponsor of the work. Del Alamo notes, however, that InGaAs transistor technology is still in its infancy. Some of the challenges include manufacturing transistors in large quantities, because InGaAs is more prone to breakage than silicon. But del Alamo expects prototype InGaAs microdevices at the required dimensions to be developed over the next two years and the technology to take off in a decade or so. "With more work, this semiconductor technology could greatly surpass silicon and allow us to continue the microelectronics revolution for years to come," del Alamo said. In addition to Intel, this research is sponsored by the Microelectronics Advanced Research Corporation. 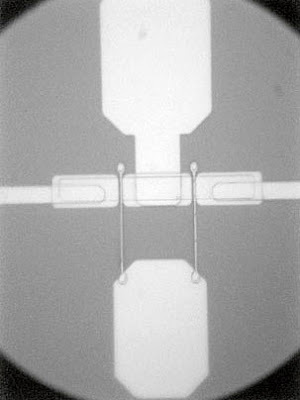 The MIT transistors were fabricated by pulling together the capabilities of three MIT laboratories: the Microsystems Technology Laboratories, the Scanning-Electron-Beam Lithography Facility and the Nanostructures Laboratory. Del Alamo notes that one reason for the exceptional performance of these transistors is the high quality of the semiconductor material, which was prepared by MBE Technology of Singapore.